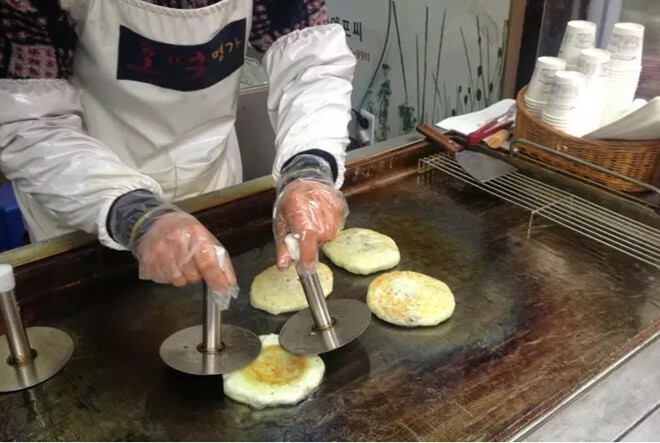 Everyone knows Korean street food is delicious and is part of the adventure when travelling Korea. Spicy rice cake Tteokbokki: If you like spicy food, you will definately in love with this. This food is made primarily of chewy rice cakes and fiery Gochujang red chili paste, which is also used in Bibimbap. 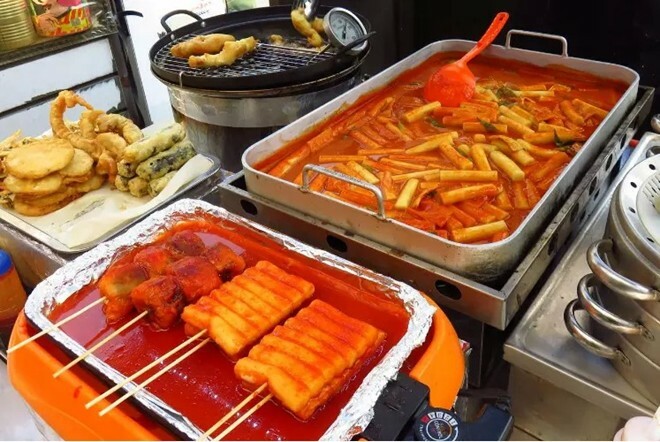 Tteokbokki was part of Korean royal court cuisine but nowadays it is mostly regarded as a street food. You can add fish cake, boiled eggs or ramen. 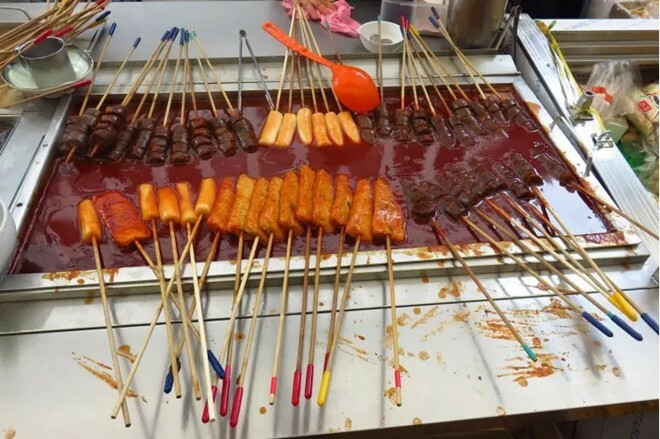 For busy people, Tteokbokki are also sold in skewers called Tteokkkochi. 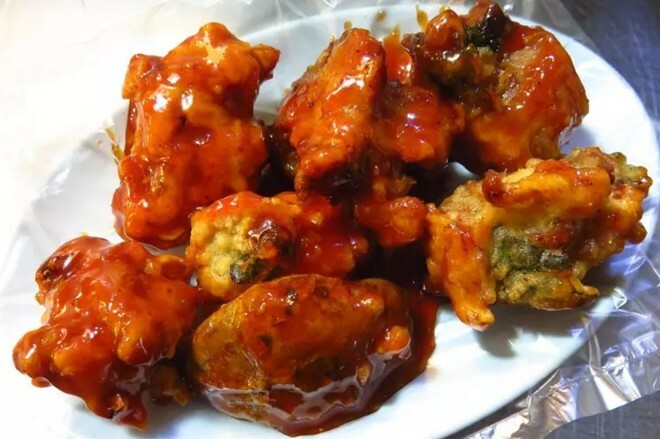 A seasoned fried chicken (Yangnyeom Tongdak):is a great combination of American and Korean cuisine style during the Korean War. Traditionally, a small whole chicken was cut into chunks, seasoned with spicy sauce, honey, sesam and nuts. Korean beer is often served with Korean fried chicken at bars as a perfect combo. Korean Tempura (Twigim): Analogous to Japanese tempura, Twigim refers to deep-fried meat, seafood, vegetable, sweet potato and also soft-boiled egg. Korean Sushi (Gimbap): There is a Korean version of sushi roll, Gimbap. 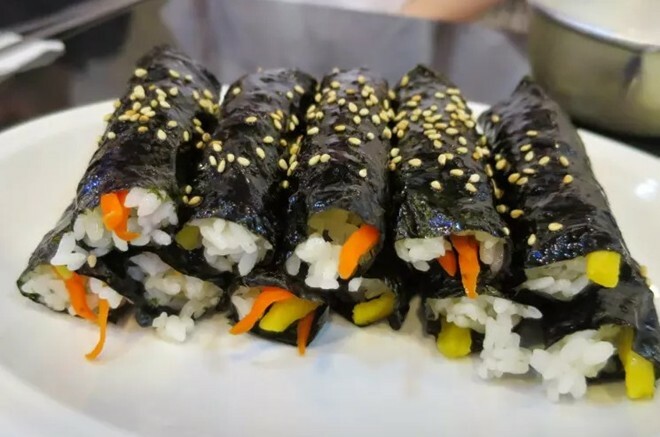 It is made with white rice and dried seaweed but the filling consists of Kimchi, eggs, tuna, meat and vegetables. Dumpling (Mandu): Dumpling is so versatile. 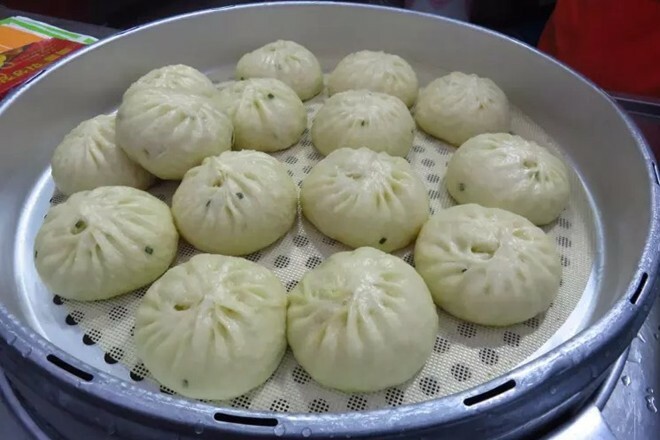 You can steam, boil, fry dumplings and eat them alone with soja sauce or add to noodle soups. Mandu requires ground pork, onions and a lot of Kimchi. Cold Noodles (Naengmyeon): Naengmyeon means “cold noodles”, consists of starchy buck wheat noodles with cucumber, beef and a boiled egg on top. While Naengmyeon is popular in summer time, Sujebi (hot noodle) is a perfect comfort food for winter days. The noodle is often added some seafood and green vegetables. 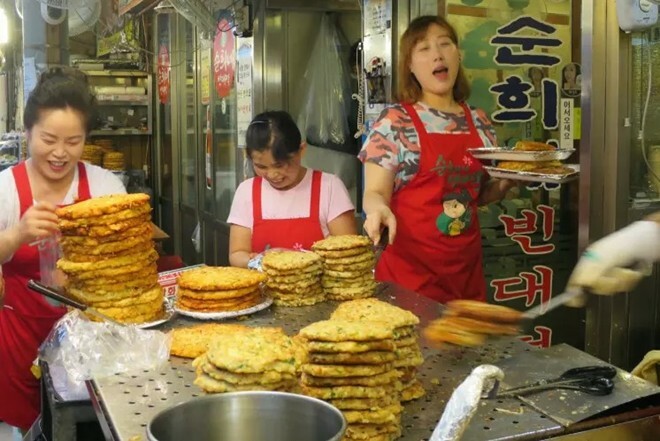 Green onion pancake (Pajeon): The famous Korean seafood green onion pancakes are made with eggs, green onions. You can also add other ingredients such as seafood, Kimchi or vegetables. 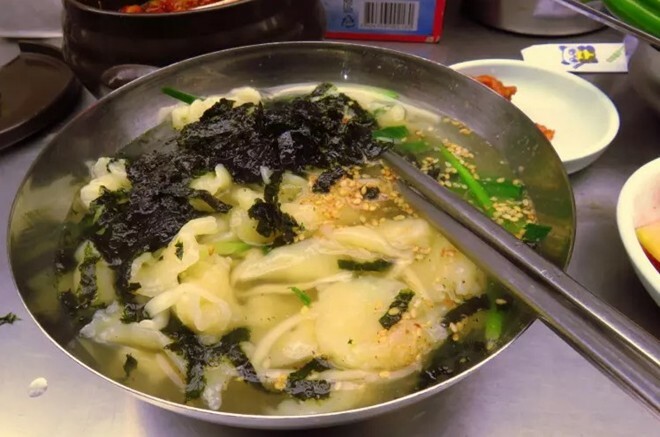 The most popular Pajeon dish is the seafood Haemul Pajeon, which usually consists of oysters or squid. Another variant is the Mung bean pancakes which are perfect for anyone vegan or off eggs for health reasons. Fishcake Odeng:This is a simple food to prepare. 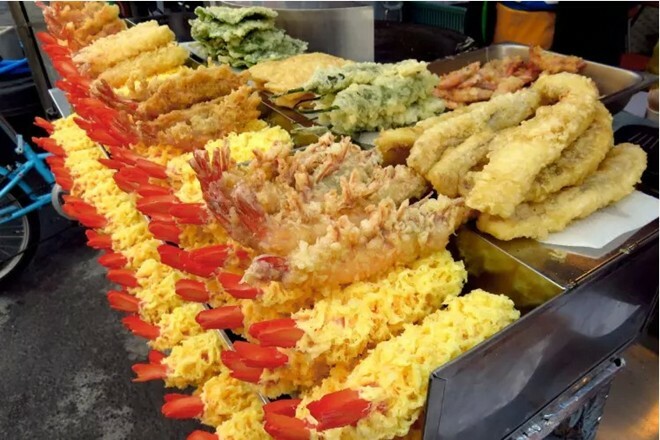 This local street food is made of fish and other ingredients such as potato starch, salt, sugar, vinegar. It is often served on a skewer in broth . Sweet Pancakes (Hotteok): The hot sweet dessert pancake is a must have food for the freezing cold in winters. 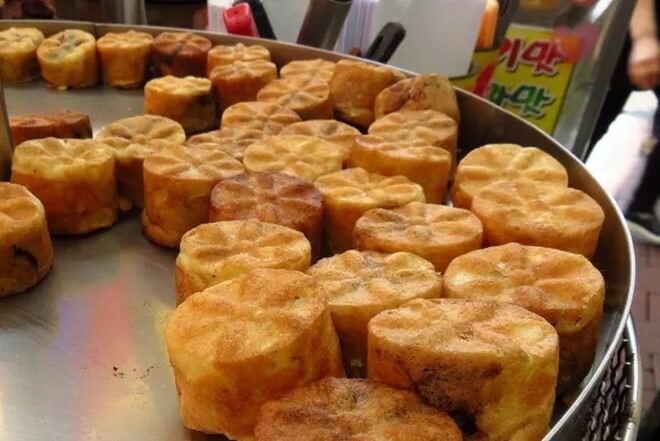 The sizzling brown sugar syrup with bits of nuts and the fried crispness on the outside make it be the most popular sweet treat from the street food vendors in Korea. Bungeoppang and Gukhwappang Pastry: these snacks are very popular in Korea. The cake is crispy outside, fish-shaped and filled with red beans. 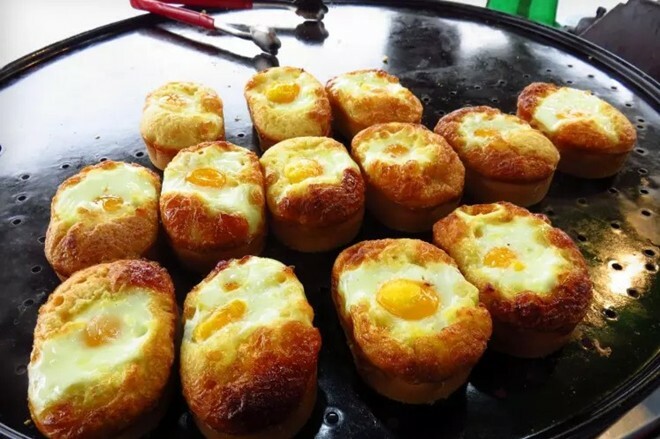 Korean Egg Bread (Gyeranppang): It is a famous snack that you can find quite easily in Korea. It is filled with an egg, shaped in a rounded rectangle and has a slight sweet and salty taste at once.